If you are looking to add a little extra sparkle and ensure you make your next special event memorable then look no further. 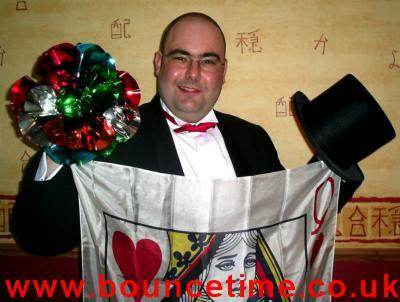 Bounce Time's 'Mr Magic' magician can guarantee a charming yet professional and enthralling performance which will captivate and leave on lookers spell bound! The quality of magic is exceptional, what more would you expect from a full member of the world famous Magic Circle and holder of the NMC Close Up Magic 2006 award and the NMC Best Trick Trophy for 2005-06. 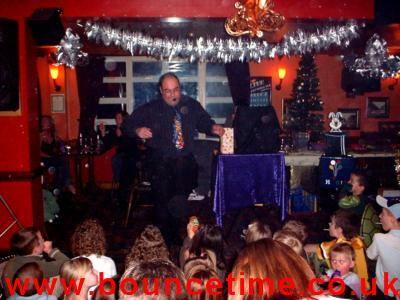 Graham prides himself on being a flexible magician, the style and presentation of the magical entertainment will always be performed in a way that suits the audience he is entertaining. Graham works under the cover of full public liability insurance, a current CRB police check and current health & safety requirements including including risk assessments and portable electrical appliance testing. Kettering, Corby, Wellingborough, Raunds, Rushden, Desborough, Rothwell, Thrapston, Northampton, Bedford, Leicester & UK Nation Wide. All Electrical Equipment used is Fully P.A.T Tested.